Formation Groups are weekly gatherings of students, for the purpose of personal, relational and spiritual growth. Our curriculum for Formation groups comes from a book entitled, Sacred Pathways by Gary Thomas. Similar to having different learning styles we also have different ways to connect with God. Through the Formation Groups/Pathways students can choose the following group to participate in: Intellectual (loving God with the mind), Contemplative (loving God through adoration), Activist/Caregiver (social justice/caring), Sensate (loving God with the senses), Naturalist (loving God outdoors), Traditionalist (loving God through ritual and symbol), and Ascetics (loving God in solitude and simplicity). 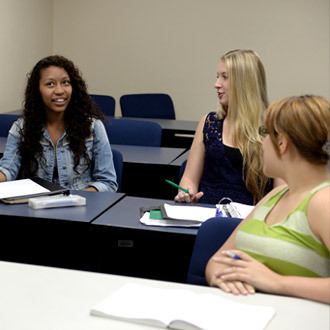 Formation Groups meet Tuesdays from 9:30 am - 10:20 am in various locations throughout the campus.